It's been quite a while since Sonia and I reviewed a Trader Joe's brand cold cereal. The Shellys were thoroughly impressed with TJ's Mango Passion Granola about 2 years back, and I recently reviewed Archer Farms Pecan Sticky Bun Granola and Chocolate Hazelnut Biscotti cereals on my other blog. But I figure it's high time we check out another TJ's breakfast food—one that's gluten free! It's a bag of granola that's not necessarily intended to be eaten with milk. The bag suggests trying it on yogurt or eating it straight out of the bag, both of which we did. But I think Sonia and I agreed that neither of the two latter cases would be regular occurrences in our home. Most of the mixture was made up of dime-sized, corn-based, circular flakes, many of which had bits of nuts, fruits, and sesame seeds fused to them, presumably with honey or evaporated cane juice. The flakes were very dry and super-crunchy. They were actually kinda hard, too. They ripped up the tops of our mouths a bit when we ate too much at once. At the bottom of the bag, underneath layers of the aforementioned flakes, there was nothing but free-floating seeds, nut-bits, and crumbs. The overall taste was that of corn flour, walnuts, sesame seeds, and raisins. The ingredients mentioned hazelnuts, almonds, coconut, apricots, and Brazil nuts, too, among other things, but I felt like many of the ingredients didn't really contribute as much to the product's flavor. Both Sonia and I thought there were way too many sesame seeds. They're potent enough in limited quantities, and I wouldn't have minded TJ's removing them from the mix altogether. We both thought there should have been more fruit, too. Raisins are the only fruit we noticed in any significant numbers, and even they were sparse compared to the corn flakes and sesame seeds. I feel like Trader Joe's wanted to make this a sweeter product. They included coconut, honey, cane juice, and some dried fruits. But they didn't quite commit to that end. I don't think it was intended to be a candy-licious kid cereal, but if they would have left out things like sesame seeds, flax seeds, and Brazil nuts, I think they could have made this a better, more dessert-like breakfast food, while still maintaining the overall wholesomeness of the product. If you're on a gluten-free diet, by all means, try it. It's definitely not a thumbs-down, but Sonia and I feel like it failed to live up to its full potential. 3's from both of us. this is definitely just bakery on main's extreme fruit and nut granola! 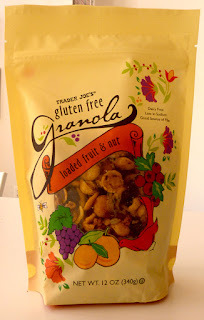 I haven't tried this flavor but I love the Trader Joe's Cranberry Maple Nut Gluten-Free Granola and find it to be great with just milk or in yogurt with banana. I think it as a really nice maple flavor and the cranberries are chewy with that sweet/tartness. I don't remember sesame seeds being in the Cranberry/Maple flavor but there are quite a few flax seeds, which I happen to like.